The Deep Sea Fishermen’s Union and the the Fishing Vessel Owners’ Association are leading efforts around Abundance Based Management of the Halibut Resource in the Bering Sea and Aleutian Island along with calling for further and more detailed scrutiny into the administration, enforcement and funding of this wholly unfair, failed and unlawful partial observer program. It is a fact that fishing observers are of paramount importance in the reduction of marine bycatch and mortality. The North Pacific Fishery Management Council (Council) currently administers two partial observer programs. One program is for bottom fishing trawlers and the other program is for fishing vessels delivering to shoreside processors or their tenders. 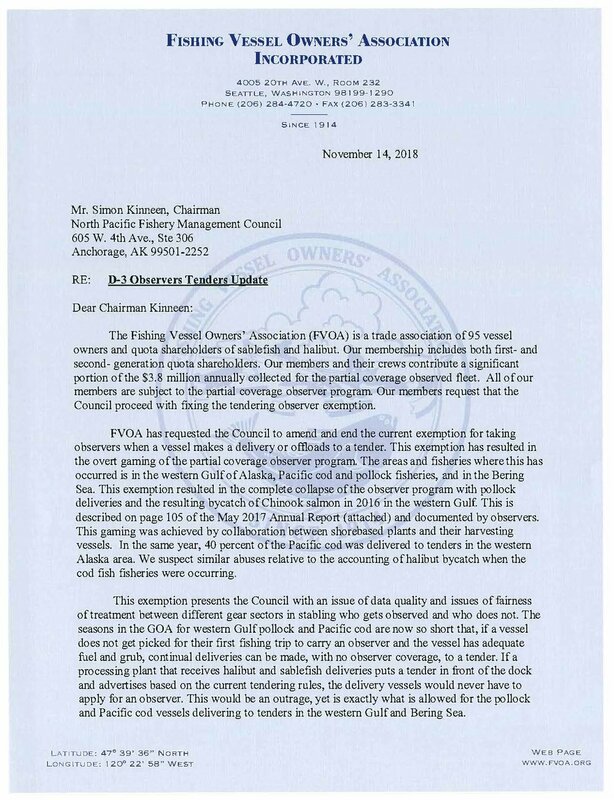 The owners of the fishing vessels over 60 feet in length and our members (crew and skippers) are forced to pay the bulk of the $3.8 million annually collected for the partial coverage observer program that effectively provides observer coverage for less than 10% of program’s coverage mandate. The Halibut and Sablefish fishermen on vessels over 60 feet cover about 70% of this cost through a delivery fee of 1.25% of ex vessel landings. As a special consideration only extending to bottom fishing trawlers, their vessels that deliver to fishing tenders are allowed them never to take aboard a fishing observer as long as they make continuous deliveries to a tender. We were recently informed that our contribution to this failed and highly suspect partial coverage observer program is likely to be increased by 60% from a gross stock expense to of 1.25% to 2% (see related post) by a trawl-centric Council as it misguidedly seeks to throw more working Halibut and Sablefish fishermen money at a failed program while the large, well healed and hard on the ocean bottom trawl companies are aided and allowed to shirk their responsibility at a sustainable fishery. The companies taking advantage of “Tendering Loophole” are the shorebased processors and largely their trawl fleet in the Western Gulf and Dutch Harbor. In a recent letter authored by Bob Alverson, the Council has been publically asked for what must be the tenth time to ensure that the fixed gear fishermen no longer suffer unequal treatment where bottom fishing trawlers are solely allowed to avoid observer coverage by making deliveries and offloads to tenders in the western Gulf of Alaska, Pacific Cod and Pollock fisheries. 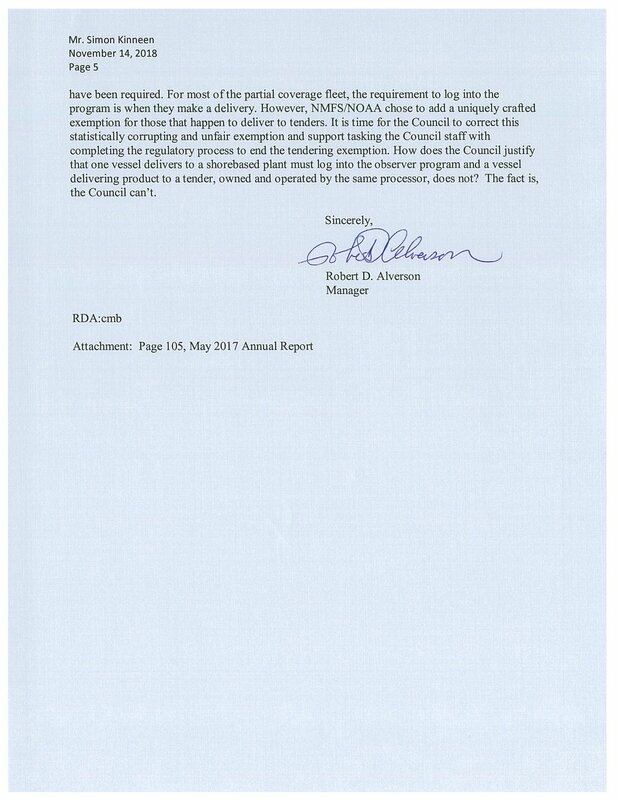 Bob Alverson’s letter documents the numerous attempts internal Council committees such as the Scientific and Statistical Committee and the Council’s Advisory Panel have made to reform the “Tendering Loophole” only to be completely stonewalled by the Council and the National Marine Fishery Service. As Bob Alverson mentions in his letter above, this “Tendering Loophole” resulted in the complete collapse of the observer program’s oversight of the pollock fishery and no doubt was a major contributing factor in the resulting bycatch of Chinook salmon in 2016 in the western Gulf as reported below on page 105 of the National Oceanic and Atmospheric Administration May 2017 Annual Report (first paragraph below) and documented by the the very observers that are ever deployed to monitor what fishing practices. The “Tendering Loophole” is actively exploited by collaboration between shorebased plants and their harvesting vessels with the full knowledge and support of the National Marine Fisheries. In 2017, 40 percent of the Pacific cod was delivered to tenders in the western Alaska area. Similar abuses relative to the accounting of halibut bycatch from within the cod fish fisheries are also occurring. Despite the demand from Washington’s Fish and Wildlife Commission for an immediate end to the inappropriate Tendering Loophole, the Council failed again at the October to immediately end this illegal activity. Nothing is more vital to the sustainability of numerous hook and line species (particularly that of Halibut and Sablefish) as the impact the bottom trawl sector is having on bycatch. Bycatch minimization and fish mortality reduction is one of the 10 National Standards (see below) of the Magnuson Steven Act requiring that bycatch be avoided and that ocean life mortality be minimized. In the lead up to the Council meeting scheduled from December 3-11, 2018 we are again seeking meaningful reform of one of the highly problematic areas of the partial coverage observer program. Bottom fishing trawlers must not be allowed to minimally interact with fish tendering vessels before delivery to shoreside fish processors, thereby avoiding the “burden” of having their highly impactful harvest go unobserved by scientist. For far too long, the Council has been resistant to the demand from industry stakeholders, environmental groups, internal Council committees such as the Scientific and Statistical Committee and the Council’s Advisory Panel and the people of Oregon, Washington and Alaska to do something about this outrageous situation immediately. Bottom fishing trawlers have the distinction of being the most wasteful as measured by the amount of fish and mammal mortality that commercial fishing creates overall. The amount of bycatch and ocean life mortality that bottom fishing trawlers produce and their impact generally on the marine environment where Halibut, Sablefish, Crab and Salmon spawn and reside as juvenile fish is driving the environment, fishing businesses and fishermen to ruin and must no longer be ignored by the North Pacific Fishery Management Council and the National Marine Fishery Service. Bottom fishing trawlers harvest what they can legally catch by scratching at the ocean bottom over an area larger than the size of many U.S. states. Their fishing practices and the area they cover has a disproportionate impact on small, family run and environmentally sustainable fixed gear Halibut and Sablefish fishermen. Members of the Deep Sea Fishermen’s Union and the fishing vessel owners have been unfairly required by the North Pacific Fishery Management Council to largely fund the entire North Pacific Fishery observer program (see related article). The Deep Sea Fishermen’s Union, other environmental stakeholders and fishing industry and an increasingly informed citizenry of Oregon, Washington and Alaska are demanding that the North Pacific Council immediately take the necessary action along with the National Marine Fishery Service to enforce the law. If stakeholder and Council Committees demands were not enough, the bottom fishing trawlers should wake up to the fact that their lack of observer coverage and their practice of abusing this Tendering Loophole will undoubtedly and rightfully threaten any trawl company’s Marine Stewardship Council (MSC) certification for lack of compliance with the program’s objectives of marine stewardship with respect to Gulf of Alaska Pacific Cod and Arrowtooth Flounder. Please do your part and contact North Pacific Fishery Management Council members and let them know you want this outrageous Tendering Loophole immediately ended and the partial observer program reformed and directed toward meaningful and fair approaches to the reduction of bycatch and the reduction of marine life mortality. Newer PostPartial Obfuscation Program - cont.